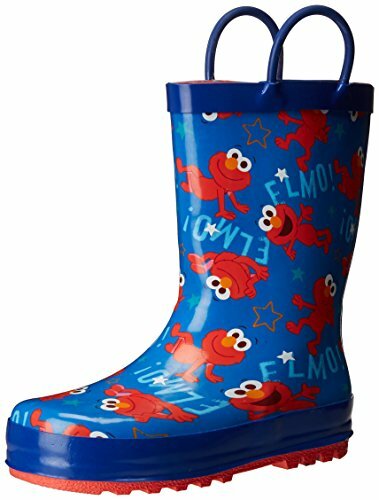 Everybody loves elmo, and now you can bring home these bright and cheerful Sesame Street elmo rain boots for splish-splash fun. Perfect for puddle jumping and turning rainy days into fun days. These waterproof, rubber rain boots are created with a process that creates a stronger rubber, that remains supple in heat and cold. Printed with bright, colorful, playful elmo graphics, they are sure to please your little one. With integrated pull loop handles, they can pull them on themselves and get ready for rainy day fun. Rain boots come in three dual sizes, size 5/6, 7/8, and size 9/10. EVERYBODY LOVES ELMO, and now you can bring home these bright and cheerful Sesame Street Elmo Rain Boots for splish-splash fun. Perfect for Puddle Jumping and turning Rainy Days into Fun Days. RUBBER NOT PVC: These rain boots are high-quality, rubber traditional waterproof boots printed with fun Elmo graphics. Waterproof seams are easy to rinse off and clean as needed. EASY ON: ALL STYLES WITH PULL HANDLES: Each boot comes with "pull handles" for easy-on: Kids can step into the rain boots themselves. Pull Loop Handles also function for hanging the boots if they need to dry out. WATERPROOF: Built to keep feet dry, these Sesame Street rain boots are completely waterproof. Soft fabric linings feel good on bare feet or when worn with socks. Bottoms have traction grooves, to channel water and provide better traction. If you have any questions about this product by Sesame Street, contact us by completing and submitting the form below. If you are looking for a specif part number, please include it with your message.